This page attempts to record what is known about the history of Froebelian Folds of Life developed from the Triple Blintz basic form and the Blintzed Windmill Base. Please contact me if you know any of this information is incorrect or if you have any other information that should be added. Thank you. This design first appears in 'The Kindergarten Principle' by Mary J Lyschinska was published in London in 1880 by Wm Isbister Ltd. The same design appears as 'The Purse' in part two of 'The Kindergarten Guide' by Maria Kraus Boelte and John Kraus, which was probably first published by E. Steiger and Company in New York in 1882. The Scent Bottle is also pictured, but not named, in Eleonore Heerwart's 'Course in Paperfolding' was first published in Dutch in 1895 then in English by Charles and Dible in London and Glasgow in 1896. 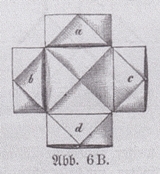 This design first appears in 'Des Kindes Erste Beschaftigungsbuch' by E Barth and W Niederley, which was first published in Bielefeld and Leipzig, and the foreword of which is dated October 1876. Part two of 'The Kindergarten Guide' by Maria Kraus Boelte and John Kraus, which was probably first published by E. Steiger and Company in New York in 1882. 'Pleasant Work for Busy Fingers' by Maggie Browne, published by Cassell and Company in London in 1896, which is an English version of 'Des Kindes Erste Beschaftigungsbuch'. 'Die Frobelschen Beschaftigungen: Das Falten' by Marie Muller-Wunderlich, which was published by Friedrich Brandstetter in Leipzig in 1900. 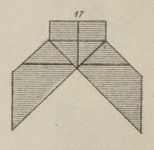 The Muff first appears in a list of designs in the 'Manuel Pratique de Jardins D'Enfants de Friedrich Froebel', which was compiled by J F Jacobs and published in Brussells and Paris in 1859. This design also appears in part two of 'The Kindergarten Guide' by Maria Kraus Boelte and John Kraus, which was probably first published by E. Steiger and Company in New York in 1882. The Muff is pictured, but not named, in Eleonore Heerwart's 'Course in Paperfolding' was first published in Dutch in 1895 then in English by Charles and Dible in London and Glasgow in 1896. This design appears, as 'The Vase', in part two of 'The Kindergarten Guide' by Maria Kraus Boelte and John Kraus, which was probably first published by E. Steiger and Company in New York in 1882. This design first appears in 'The Kindergarten Principle' by Mary J Lyschinska, whicjh was published in London in 1880 by Wm Isbister Ltd.
... and in 'Die Frobelschen Beschaftigungen: Das Falten' by Marie Muller-Wunderlich, which was published by Friedrich Brandstetter in Leipzig in 1900. 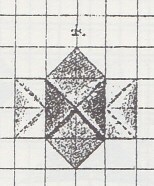 The Cross (La croix) appears in a list of designs in the 'Manuel Pratique de Jardins D'Enfants de Friedrich Froebel', which was compiled by J F Jacobs and published in Brussells and Paris in 1859. The earliest known illustration of this design (pictured from both front and back) is found in 'De Kleine Papierwerkers', written by Elise Van Calcar and published by K H Schadd in Amsterdam in 1863. 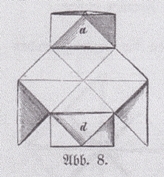 The design appears twice in 'Des Kindes Erste Beschaftigungsbuch' by E Barth and W Niederley, which was first published in Bielefeld and Leipzig, and the foreword of which is dated October 1876, first as a paper fold and then, in a different chapter, as a napkin fold. There is mention of 'The Cross' in 'The Kindergarten Principle' by Mary J Lyschinska, which was published in London in 1880 by Wm Isbister Ltd, but no illustration is provided. 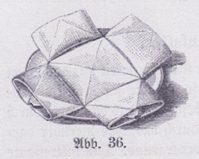 The design also appears, in a small section in the paper folding chapter which is devoted to napkin folds, in part two of 'The Kindergarten Guide' by Maria Kraus Boelte and John Kraus, which was probably first published by E. Steiger and Company in New York in 1882. The Cross is pictured, but not named, in Eleonore Heerwart's 'Course in Paperfolding' was first published in Dutch in 1895 then in English by Charles and Dible in London and Glasgow in 1896. This design also appear in 'Pleasant Work for Busy Fingers' by Maggie Browne, which was published by Cassell and Company in London in 1896. Thios book is an English version of 'Des Kindes Erste Beschaftigungsbuch'. This design is developed from the Cross in 'Die Frobelschen Beschaftigungen: Das Falten' by Marie Muller-Wunderlich, which was published by Friedrich Brandstetter in Leipzig in 1900. In 'Le Livre des Amusettes' by Toto was published in Paris by Charles Mendel in 1899 the reverse side of the Cross is developed into the Double Cross shown below. 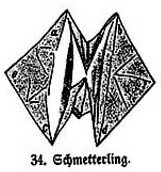 The shirt, which is made by folding the Cross in half downwards, appears in 'Des Kindes Erste Beschaftigungsbuch' by E Barth and W Niederley, which was first published in Bielefeld and Leipzig, and the foreword of which is dated October 1876. There is mention of a Hat made by folding the Cross in half, in 'The Kindergarten Principle' by Mary J Lyschinska, which was published in London in 1880 by Wm Isbister Ltd, but no illustration is provided. The Jacket (La veste du mineur) appears in a list of designs in the 'Manuel Pratique de Jardins D'Enfants de Friedrich Froebel', which was compiled by J F Jacobs and published in Brussells and Paris in 1859. The earliest known illustration of this design is found in 'De Kleine Papierwerkers', written by Elise Van Calcar and published by K H Schadd in Amsterdam in 1863. 'Des Kindes Erste Beschaftigungsbuch' by E Barth and W Niederley, which was first published in Bielefeld and Leipzig, and the foreword of which is dated October 1876. 'The Kindergarten Principle' by Mary J Lyschinska was published in London in 1880 by Wm Isbister Ltd.
Eleonore Heerwart's 'Course in Paperfolding', which bwas first published in Dutch in 1895 then in English by Charles and Dible in London and Glasgow in 1896. The Jacket is pictured, but not named, in this book. 'Pleasant Work for Busy Fingers' by Maggie Browne, which was published by Cassell and Company in London in 1896. Thios book is an English version of 'Des Kindes Erste Beschaftigungsbuch'. The Trousers (Le pantalon) appear in a list of designs in the 'Manuel Pratique de Jardins D'Enfants de Friedrich Froebel', which was compiled by J F Jacobs and published in Brussells and Paris in 1859. Part two of 'The Kindergarten Guide' by Maria Kraus Boelte and John Kraus, which was probably first published by E. Steiger and Company in New York in 1882, as 'The Pair of Pants'. Eleonore Heerwart's 'Course in Paperfolding' was first published in Dutch in 1895 then in English by Charles and Dible in London and Glasgow in 1896. The Trousers are pictured, but not named, in this book. The Steamship first occurs as 'Der inktkoker' (literally the well) in 'De Kleine Papierwerkers', written by Elise Van Calcar and published by K H Schadd in Amsterdam in 1863. This design appears in a list of designs in the 'Manuel Pratique de Jardins D'Enfants de Friedrich Froebel', which was compiled by J F Jacobs and published in Brussells and Paris in 1859, presumably as a step towards making the Double Hulled Boat. 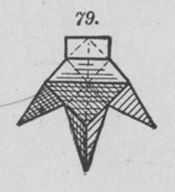 No illustration of this design is known but I presume it would be identical in appearance to the Cigar Case, which is folded from a standard windmill base. 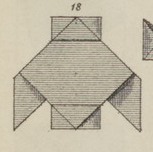 This design appears in a list of designs in the 'Manuel Pratique de Jardins D'Enfants de Friedrich Froebel', which was compiled by J F Jacobs and published in Brussells and Paris in 1859, presumably as a step towards making the Junk Box. The Double Hulled Boat is pictured, but not named, in Eleonore Heerwart's 'Course in Paperfolding' was first published in Dutch in 1895 then in English by Charles and Dible in London and Glasgow in 1896. This design also appears in 'Paper Magic' by Will Blyth, which was first published by C Arthur Pearson in London in 1920. The Coin Wallet is developed from the Dopuble Hulled Boat in the same way as the Portfolio is developed from the Double Boat. 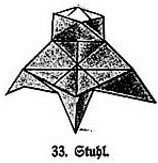 It first appears in 'Die Frobelschen Beschaftigungen: Das Falten' by Marie Muller-Wunderlich, which was published by Friedrich Brandstetter in Leipzig in 1900. The Butterfly, which is developed from the Double Hulled Boat by pulling out the internal flaps, first appears in 'Die Frobelschen Beschaftigungen: Das Falten' by Marie Muller-Wunderlich, which was published by Friedrich Brandstetter in Leipzig in 1900. The Junk Box appears, as simply 'La boite' or 'the box' in a list of designs in the 'Manuel Pratique de Jardins D'Enfants de Friedrich Froebel', which was compiled by J F Jacobs and published in Brussells and Paris in 1859. I call it the Junk Box because it can be turned into the Chinese Junk. 'The Kindergarten Principle' by Mary J Lyschinska, published in London in 1880 by Wm Isbister Ltd, as just 'The Box'. 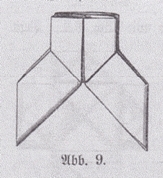 Part two of 'The Kindergarten Guide' by Maria Kraus Boelte and John Kraus, probably first published by E. Steiger and Company in New York in 1882, as 'The Square Box Having Two 'Lids'. Eleonore Heerwart's 'Course in Paperfolding', which was first published in Dutch in 1895 then in English by Charles and Dible in London and Glasgow in 1896. The Junk Box is pictured but not named. It is not developed into the Chinese Junk in this book. 'Pleasant Work for Busy Fingers' by Maggie Browne, which was published by Cassell and Company in London in 1896. This book is an English version of 'Des Kindes Erste Beschaftigungsbuch'. 'Le Livre des Amusettes' by Toto was published in Paris by Charles Mendel in 1899. It is not developed into the Chinese Junk in this book. 'Paper Magic' by Will Blyth, which was first published by C Arthur Pearson in London in 1920, as 'The Pin Tray'. The Picture Frame appears, as simply 'Le cadre' or 'the frame' in a list of designs in the 'Manuel Pratique de Jardins D'Enfants de Friedrich Froebel', which was compiled by J F Jacobs and published in Brussells and Paris in 1859. I call it the Picture Frame to distinguish it from the Frame which can be made by collapsing the sides of the Open Box. This design is mentioned in 'The Kindergarten Principle' by Mary J Lyschinska, which was published in London in 1880 by Wm Isbister Ltd, but no illustration is provided. 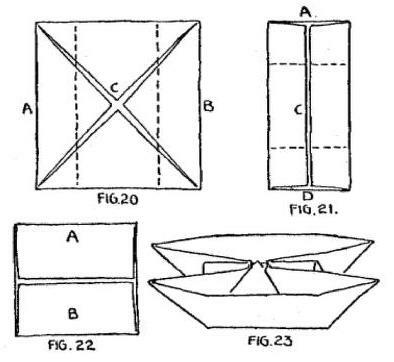 The Picture Frame is pictured, but not named, in Eleonore Heerwart's 'Course in Paperfolding' was first published in Dutch in 1895 then in English by Charles and Dible in London and Glasgow in 1896. The Looking Glass appears, as simply 'Le miroir' in a list of designs in the 'Manuel Pratique de Jardins D'Enfants de Friedrich Froebel', which was compiled by J F Jacobs and published in Brussells and Paris in 1859. I call it the Looking Glass to distinguish it from the Mirror which can be made by collapsing the sides of the Frame developed from a standard windmill base. The design also appears in 'Des Kindes Erste Beschaftigungsbuch' by E Barth and W Niederley, which was first published in Bielefeld and Leipzig, and the foreword of which is dated October 1876. 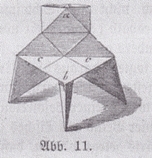 The Looking Glass is pictured, but not named, in Eleonore Heerwart's 'Course in Paperfolding' was first published in Dutch in 1895 then in English by Charles and Dible in London and Glasgow in 1896. The Looking Glass also appears in 'Pleasant Work for Busy Fingers' by Maggie Browne, which was published by Cassell and Company in London in 1896. This book is an English version of 'Des Kindes Erste Beschaftigungsbuch'. In a Froebelian context, the Chinese Junk first appears in a list of designs in the 'Manuel Pratique de Jardins D'Enfants de Friedrich Froebel', which was compiled by J F Jacobs and published in Brussells and Paris in 1859 and is first illustrated in 'De Kleine Papierwerkers', written by Elise Van Calcar and published by K H Schadd in Amsterdam in 1863. Further information about the history of this design, including earlier references and an earlier illustration, can be found here.